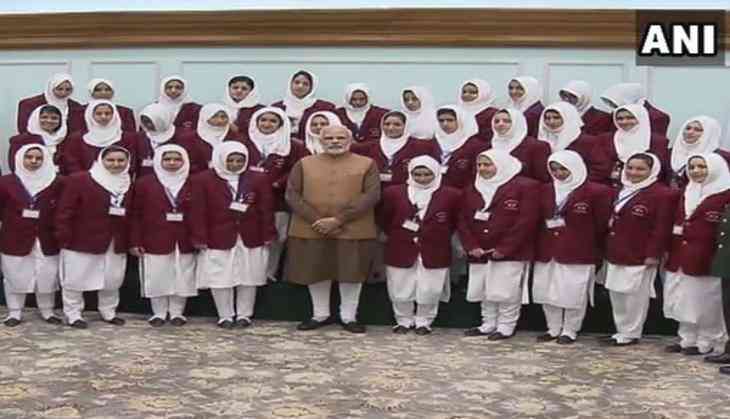 A group of 30 school girls from Jammu and Kashmir's Srinagar met Prime Minister Narendra Modi here today. The students are currently on a tour to various parts of the country, as part of the Indian Army's Operation Sadbhavna. In the meeting, Prime Minister Modi interacted with the students on various issues such as their dreams and aspirations, girls' education and Swachh Bharat. During the meeting, the girls posed various questions to the Prime Minister, to which he explained the various steps being taken for girls' education. He further explained the various spin-off benefits, including on health and tourism that can accrue through the Swachh Bharat Mission. Prime Minister Modi also explained the students about the benefits of concentration-improving Yoga. He further appreciated the increasing number of youths from Jammu and Kashmir making it to the civil services and showing great potential in sports. The Prime Minister asserted that India has a bright future, and the children and youths of Jammu and Kashmir have a lot to contribute to the nation.